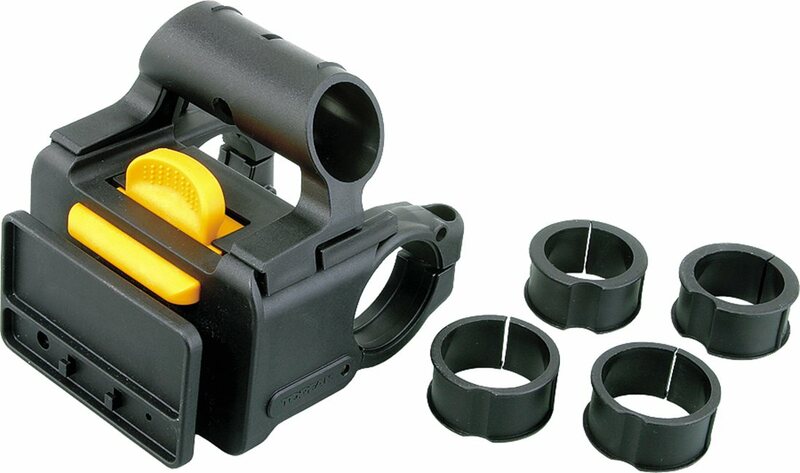 QuickClick handlebar mount. Fast & easy attachment of Topeak handlebar bags and baskets. Comes with shims to fit road or MTB handlebars. An integrated mounting bar for cycle computer and/or mount for lights or other accessories. Cable secures the brackets position so it won't pivot once installed. * This is not backward compatible with handlebar bag products prior to 2009. I broke my first topeak fixer. So I had to buy other. Good material. Easy to install. This new model has a cable like a brake cable, that prevets breaking when you try to fix on the handlebar. This is the correct bracket for most (though not all) of the Topeak handlebar bags. I bought it so I could use my Tour Guide bag on a second bike without having to move the bracket that originally came with the bag. Be sure to follow the instructions carefully: if you omit the guide cable that goes under the stem the bracket will slip on the bars as you go over bumps, allowing the bag to slouch downwards towards the tire. Overall, the Tour Guide back + this bracket make a nice bar bag (once you get over the nerd factor of having a bar bag in the first place). I now use the bag on both my commuter bike and tandem bike.